APNIC recently participated in the VietNam National Internet eXchange Network Operators Group (VNIX-NOG) meeting in Da Nang City, Viet Nam. The event welcomed 102 attendees and included presentations on topics including RPKI, routing, IoT, and DNS. See the full program here. 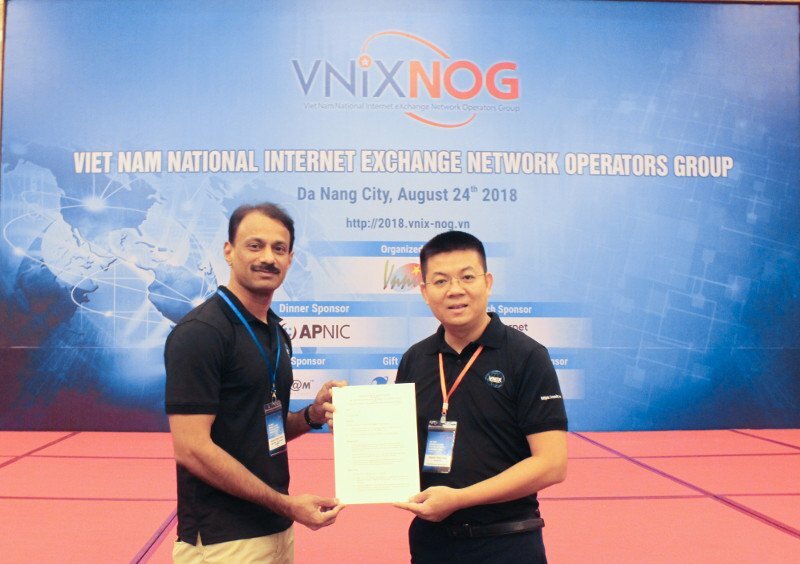 APNIC and VNNIC signed a Memorandum of Understanding (MoU), confirming the ongoing co-operation between the two organizations. Figure 1 — APNIC and VNNIC signed an MoU at VNIX-NOG. APNIC’s Sunny Chendi presented ‘Policies that Changed the Internet’ and ‘Secure Inter-domain Routing with RPKI’. APNIC also sponsored the closing dinner.